When Edie is caught in a compromising position at her colleagues' wedding, all the blame falls on her – turns out that personal popularity in the office is not that different from your schooldays. Shamed online and ostracized by everyone she knows, Edie's forced to take an extended sabbatical – ghostwriting an autobiography for hot new acting talent, Elliot Owen. Easy, right? Wrong. Banished back to her hometown of Nottingham, Edie is not only dealing with a man who probably hasn't heard the word 'no' in a decade, but also suffering an excruciating regression to her teenage years as she moves back in with her widowed father and judgy, layabout sister. Edie Thompson thought she was doing the right thing by attending the wedding of two coworkers. Then she's caught off-guard by the newly wedded husband in a kiss that's witnessed by his new bride. Edie quickly becomes the pariah in her office and on social media. Unfortunately, her boss is reluctant to allow her to resign and gives her the opportunity ghostwrite an autobiography for actor Elliot Owen. 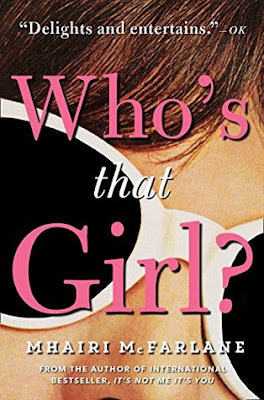 Edie is now forced to deal with the continuing fallout from the kiss at the wedding, an actor that's reluctant to participate in the autobiography, and her family in Who's That Girl? by Mhairi McFarlane. Edie thought she was participating in a harmless flirtation and just being friendly with her male coworker. She thought attending the wedding of her coworkers was supportive. She had no intention of causing any problems for the newlyweds, but problems arise when the groom kisses her and they are caught by his bride. Edie quickly becomes "the other woman" and is targeted by the bride's friends and family. In an effort to "do the right thing", Edie attempts to resign, but her boss thinks it will all blow over. He strongly suggests that Edie take some time away from the office, go to Nottingham (Edie's hometown), and ghostwrite an autobiography for an actor. Edie accepts, thinking things can't possibly get any worse (she's wrong). She's hounded on social media to the point that she closes all of her online accounts. To say that Edie has a tempestuous relationship with her younger sister Meg is a bit of an understatement and the two siblings constantly rub each other the wrong way. After a bit of a rocky start with the ghost writing job, Edie becomes friendly with Elliot and encourages him to use a different slant with this autobiography. Edie befriends an elderly neighbor and even reconnects with old school friends. Just when it seems that things are on an even keel, Edie is caught up in another controversy and this one goes public with the cry of "who's that girl?" in the tabloids. I found Who's That Girl? to be a rather fast-paced and engaging read, although it did take me awhile to get into the story. I felt sympathy towards Edie as a result of the onslaught of bullying she had to deal with from so-called friends, coworkers, and people she doesn't even know. I found the characters to be fully developed, all-too-flawed and realistic, and the action plausible. This was the first book I've read by Ms. McFarlane and I wasn't quite sure what to expect; but this is a story that provides a little bit of everything: personal drama, family drama, angst, self-awareness, grief, bullying, romance, and humor. This isn't a typical romance or ChickLit read, so I feel safe in saying that if you enjoy a well-written story filled with realism and touches of humor then Who's That Girl? may be just the book for you. This may have been my first Mhairi McFarlane read, but I'm looking forward to reading all of her previous books while waiting for a new release. Disclaimer: I received a free digital copy of this book for review purposes. I was not paid, required, or otherwise obligated to write a positive review. The opinions I have expressed are my own. I am disclosing this in accordance with the Federal Trade Commission's 16 CFR, Part 255: "Guides Concerning the Use of Endorsements and Testimonials in Advertising." She is based in Nottingham where she used to be a local journalist and now she's a freelance writer and sometime-blogger, which we all know is code for messing about on Twitter. You can follow her on Twitter: @MhairiMcF. Labels: Blog Tour, Book Review, HarperCollins, Mhairi McFarlane, TLC Book Tours, WHO'S THAT GIRL? Poor Edie ... she certainly got caught up in a mess of a situation! I hope things turn out well for her in the end! I really do like romance, I just like my romance to be wrapped up in a really good story. This sounds like it fits the bill!